Last Saturday, I went to Kakigori, the Gardens Mall with 3 of my friends to try their desserts. 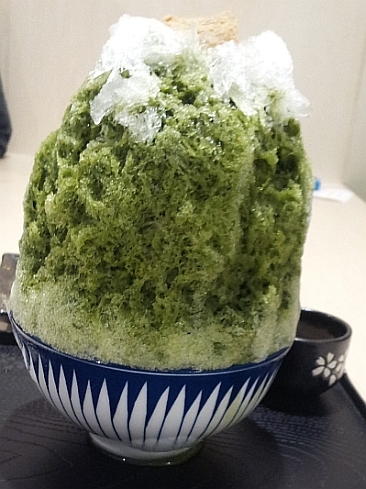 We ordereed a bowl of Uji Matcha Kakigori - MYR17 nett - (shaved ice) which includes a small cup of kinako (roasted soy flour) milk and topped with a piece of warabimochi. I also ordered a plate of mixed warabimochi (MYR14 nett) - coated with kinako powder and matcha powder. Warabimochi a jelly like cube made from bracken starch. Bracken starch is made from the rhizomes (underground stems) of bracken which is a large fern. This warabimochi tastes almost like the ones I ate in Kyoto but is a bit more firm but close enough. The cup of hot matcha at MYR5 nett is an add on to our other purchases. It is not sold on its own and is not very thick like other hot matcha that I have tasted. The matcha taste is there but not very strong and it is slightly sweet. Within this huge ice shavings (I need 3 friends to help me eat it), there are hidden red beans. The roasted soy flour (kinako) milk tastes good with the fine shaved ice which is not as fine as the powdery bingsu at Hanbing but the texture feels fine enough on our tongues. 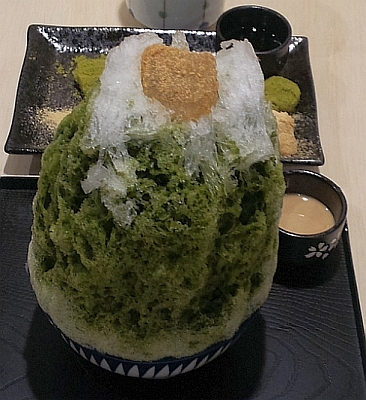 For those who do not like matcha, there are other flavours of kakigori too. All the other kakigori are as tall as this one. 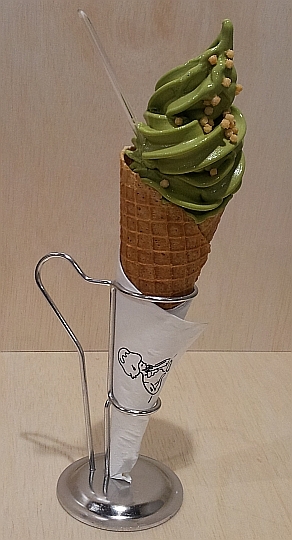 A matcha softserve to share (MYR8 nett). It is topped with roasted puffed rice beads. The homemade cone is a bit too sweet for me. The matcha taste is not as strong as some other matcha softserve that I have eaten but meets the requirement of a nice authentic matcha taste. Total bill is MYR44 nett. We will be back for their other desserts. 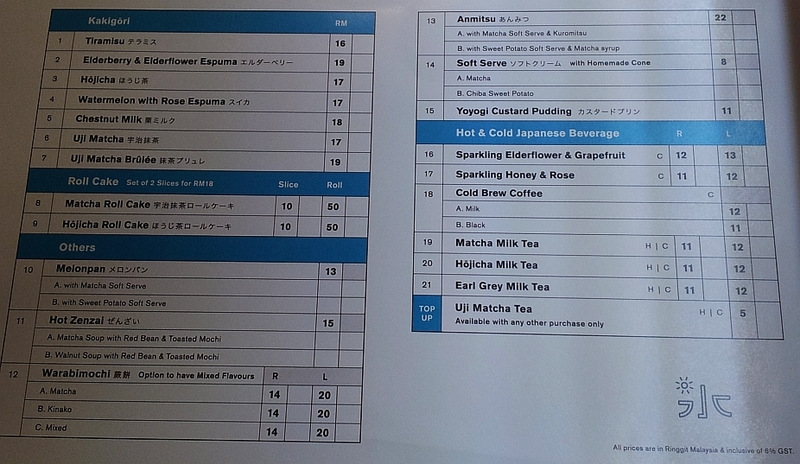 They have revised their menu to look like the above. Please click on it for a larger image. From what you wrote, I am sure you will like this. I'd try something else, not a fan of matcha, or anything green tea. you can try the watermelon and rose espuma kaligori. 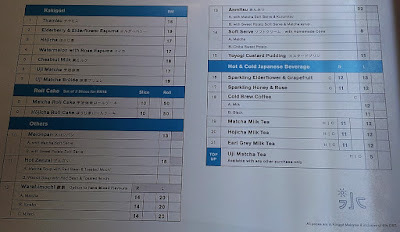 Unfortunately, I dislike matcha in desserts and ice cream though I love to drink it. I think if you are willing to give this good quality matcha desserts a chance you might be surprised that you may like it like you like chewy cookies now. Cannot judge all matcha desserts based on a few that you have tried. Wow! Very tall matcha dessert. I seldom take matcha products but I am sure I would love this. you and your family would love it for sure! Wahhh..very special desserts indeed, Mun! I would like to try too.. I love the ice cream but haven't tried with ice shaving. So a kakigori is like a bingsu... I'm learning from your blog! The Koreans definitely make the finest and powdery shaved ice! It reminds me of the powdery snow in Winter. This Japanese version that you tried was very neatly presented. you are right about the powdery snow analogy!